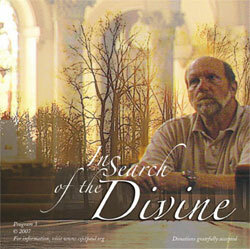 The third edition of In Search of the Divine features Sister Kate Holmberg, CSJ, who writes icons, Sister Marie Kevin Tighe, SP, a Sister of Providence who tirelessly worked to get Mother Theodore Guerin sainted; Philip McCord, whose miracle of restored vision became part of Saint Guerin’s journey to sainthood; and descriptions by Sant Dharmananda, a Hindu monk and Sister Jane de Chantal Smisek, VHM, a Sister of the Visitation, who talk about praying with beads. Its runtime is 28 minutes. Request a copy or make a comment about this program. The following are brief clips from episode #3 of In Search of the Divine.